Prem Chowdhry, Scarlet Woman (2008). Oil on canvas, 100 × 72 cm. Prem Chowdhry’s Scarlet Woman appeared on the cover of the Autumn 2010 issue of Signs (volume 36, number 1), the “Feminists Theorize International Political Economy” special issue edited by Shirin M. Rai and Kate Bedford. A multitextural work, this painting poses a dilemma: is it the same woman or two different women shown in response to life’s relationships and its complexities? The image is Indian in conception but universal in its reach and sensibilities. The use of space and time highlight the contradictions in life relating to work and experiences we can recognize and empathize with. Juxtaposed with the female form, the bird is used in a variety of ways –as a witness, a companion, a transient symbol of freedom—to highlight the expectations and anxieties felt by the protagonist/s and how they construe their freedom and confinement. © 2008 by Prem Chowdhry. Permission to reprint may be obtained only from the artist. 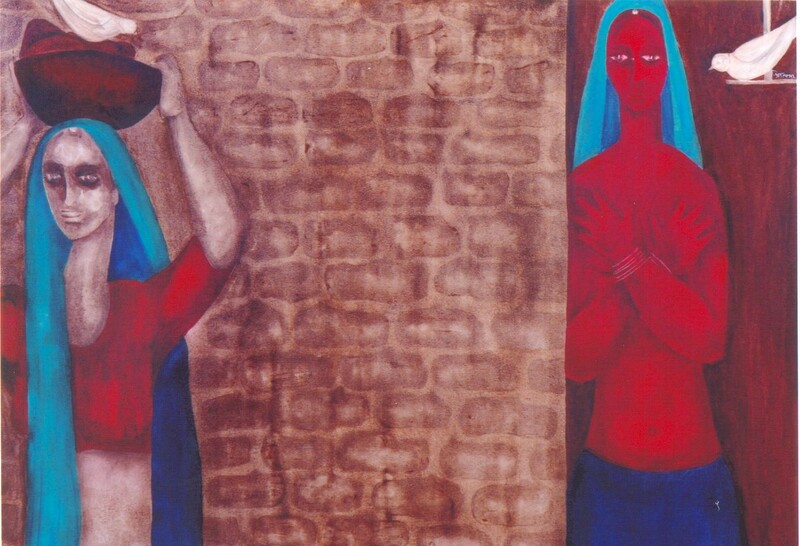 Prem Chowdhry is a Delhi-based self-taught artist who has exhibited in India and abroad. Known for her distinct style, her works have been described as “bold and intense” and “thought provoking with a touch of timelessness.” Formerly a professorial fellow of the University Grants Commission, India, she is also a well known feminist historian and social scientist. She is the author of Contentious Marriages, Eloping Couples: Gender, Caste and Patriarchy in Northern India (New Delhi: Oxford University Press, 2007); Colonial India and the Making of Empire Cinema: Image, Ideology and Identity, (New Delhi: Vistaar, 2000); The Veiled Women: Shifting Gender Relations in Rural Haryana, 1880-1990 (New Delhi: Oxford University Press, 1994); Punjab Politics: The Role of Sir Chhotu Ram (New Delhi: Vikhas, 1984); as well as a large number of research papers.